Jackson calls the documentary a "gross distortion"
Michael Jackson's statement responding to the Martin Bashir documentary Living with Michael Jackson, which shown on ITV1 on Monday. 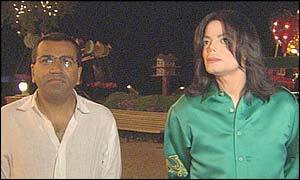 Michael is devastated and feels utterly betrayed by the British television programme, Living With Michael Jackson, presented by Martin Bashir and broadcast in the UK on Monday, February 3, 2003, which he regards as a gross distortion of the truth and a tawdry attempt to misrepresent his life and his abilities as a father. In a number of crucial respects Michael is concerned that Martin Bashir and Granada Television have broken the trust he placed in them. In particular, he felt he had obtained their assurance that his children would not be featured in any way in the broadcast programme. Michael repeatedly asked Bashir to stop filming his children, and was promised by him that the footage of his children would be taken out in the final edit but, Bashir said shooting should not be stopped because "it would break the continuity of filming". Michael is deeply upset that the programme sensationally sets out to use two or three pieces of footage giving a wholly distorted picture of his behaviour and conduct as a father. Michael feels particularly devastated that he has been treated so badly by Martin Bashir, whom he let into the Jackson family home on a number of occasions over eight months, in the belief that Bashir wished to make a genuine documentary of his life. Michael believes that what was eventually broadcast was a salacious ratings chaser, designed to celebrate Martin Bashir, and which was indifferent to the effect on Michael personally, his family and his close friends. Michael originally consented to grant Bashir extended access to the Neverland Valley Ranch, his family and Michael himself, because he wanted to give the world a faithful representation of the truth about his life. Michael believes that the programme Bashir has produced is a travesty of the truth. Michael would never have consented to participating in this film if he had been aware of how Bashir was going to falsely portray him. Michael believes that this programme was intentionally produced and edited with a view to broadcasting sensationalised innuendo. Michael feels deeply angry that the programme could have led viewers to conclude that he abuses children in any way. Michael Jackson has never, and would never, treat a child inappropriately or expose them to any harm and totally refutes any suggestions to the contrary. Michael would never betray the trust that a child, or their parents, might place in him. Michael was today [Thursday] moved to make the following personal statement: "I trusted Martin Bashir to come into my life and that of my family because I wanted the truth to be told. "Martin Bashir persuaded me to trust him that his would be an honest and fair portrayal of my life and told me that he was 'the man that turned Diana's life around'. "I am surprised that a professional journalist would compromise his integrity by deceiving me in this way. "Today I feel more betrayed than perhaps ever before; that someone, who had got to know my children, my staff and me, whom I let into my heart and told the truth, could then sacrifice the trust I placed in him and produce this terrible and unfair programme. "Everyone who knows me will know the truth which is that my children come first in my life and that I would never harm any child. "I also want to thank my fans around the world for the overwhelming number of messages of support that I have received, particularly from Great Britain, where people have e-mailed me and said how appalled they were by the Bashir film. "Their love and support has touched me greatly." These comments are excerpts from a videotaped statement from Michael Jackson, which shall be released after the airing of the Bashir television special in the United States. Debbie Rowe, Michael's ex-wife and the mother of two of his children reacted today: "It breaks my heart that anyone could truly believe that Michael would do anything to harm or endanger our children: they are the most important thing in his life."